And in 1963 we just got on with it; I don't remember all this "schools closed" nonsense, and I was at school then. In fact I do remember that the heating failed in the school, due to underground pipes freezing. The reaction? Temporary electric heaters in all the classrooms, we all kept our coats and scarves on, and education continued. Men were men in those days, I tell you. You got to wonder at the strength of al gore and his fuckwit buddies sphincter muscles for the captivity of their brain-cells. And he got a peace prize for this crap, - but then again, so did arafat, in company with a host of other political clowns. And I suppose you could say that once politicians have such a control of industry, the fact of political bribes emanating from industry, and blatant greed contained in the DNA of every politician, merely asserts itself more blatantly, given the non-accountable political structures being constructed. I am mindfull of a recent protest against the bank bailouts which marched down Wall Street. local wind patterns, buddy, wind patterns. Or, small movements of the line within a long term pattern. Anon - a day's light snow in the UK does not make a global warming conspiracy in the US. Bah humbug to ye of 1963 - we all go ton with it generation....so what? I think the kids would rather have a day off and I wager you would have done too at the time if given a chance. Less than 1mm of snow here. It will all be gone by 11am, heating up already. Not sure what the meteorological reason is but when adjacent towns and villages are snowed under or flooded out, it all passes us by. Shame really.. my kids are at school. My view is less scenic, and includes an office car park, and I have had the amusement of watching a brain donor in an expensive Mercedes spend 10 minutes to advance all of 20 feet, while revving furiously. Best free entertainment in, erm, days. It amuses the hell out of me that a bit of cold brings all the anti-GW shills. 10:47, don't spoil our little game. After all, if it were the warmest winter in twenty years rather than the coldest, do you think Al Gore would be maintaining a dignified silence, because it's just weather, not climate? But actually, there's been no warming for ten years while CO2 has continued to increase, so perhaps we should be re-examining those assumptions? Just asking. lovely & warm in my office at home!The children seem to be happy off school going past with sledges found deep in the garage !!!!! I posted a link in my first comment on the (obviously mistaken) assumption that you would read it. CU, I must say you are a most blinkered blogger, to the point of willful ignorance, or is it the reliance on a flawed educational attainment, that is visibly falling apart in the current meltdown, to which it has no answer, influenced too by your current employment? That comment may sound caustic. Such was not its intention. It is to cause you to reflect beyond your usual stamping ground, and consider fully the global opera, and its dominant characters, currently on display, not merely in the area of climate. You wrongly misinterpreted my comments on the global warming conspiracy. It is global, not US. Let me put it very simply:- why would anyone seek to tax the industrial/commercial use of one of the most common atoms in this universe, and to convince the world of this need by the flagrant, blatant manipulation of data, current AND HISTORICAL, and so many branches/disciplines of science. Manipulation is accomplished at UN level. Who has that power? Think CU! A reversion to mean in the arctic ice cap, within 3 months, (now that super-normal recent sunspot activity has ceased, - maybe temporarily) is hardly "weather", it is "climate". The sunspot activity which created your fiction of man-made global warming was melting the ice-caps throughout the solar system at the same rate as planet earth. If you could be bothered to stop shilling global warming, and check reliable science, ie, NOT UN/GORE/BBC pronouncements, you would find that those same polar icecaps in the solar system are now re-freezing in tandem with planet earth. You would also find so many blatant errors/distortions in the UK gov't "green" energy production, plans/statistics/economics, that you would assume a reason behind them that had the intention to totally mislead the population, and remember the political impulse for these economic obscenities comes from the EU bureaucracy. If you wish to address my comments, please do so in the first person in future. Up to our ears in it here in the Hampshire Downs. I too remember 1963. The snow started on Boxing Day and lasted till March. At one point our garden was under 3 feet of it; I certainly don't recall any of this current, pathetic flapdoodle. didn't realise it would still be there 3 months later ! Three inches here and the schools are all closed. Pathetic. I too remember 1963, but more especially 1968 when the school boiler broke and we spent the entire winter with no heating whatsoever. Coats on, hats on and running on the spot every 15 minutes. I'm throughly enjoying this new Green meme of "weather not climate". I don't remember the lying twats coming out with that in 1998 when El Nino gave us a hot year, strangely close to a solar maximum. Remember: climate is what you expect, weather is what you get. Please nobody hold the front page! 3 months isn't climate at all, it's a datapoint. Try 300 months of a return to a 'normal' cycle and you'll be right. As for the ice caps coverage reversion to mean, that was helped by a period of sustained cold weather allowing and yet the VOLUME was actually very low, as was the age of the ice - only around 5% of it was over 5 years old. Nice try though. As for other ice caps melting - I'm assuming your referring the loss in the Martian caps? - if you're seriously suggesting comparing the two atmospheres off the bat you might want to engage in a little 'reliable science' of your own. Britain has never had a climate. We have only ever had weather. I don't make any assumptions, I'm no particular fan of the Chicken Littles who spin GW - just look at the dodgy data NASA has been chucking out at the behest of Hansen. Both sides are cherry picking data, spinning the results and only applying some of the findings. It's insane. However, the untainted data displays that whilst there are multiple sources for GW, by far the most influential is human activity. Events such as radiative forcing account for some of the increase, but when you add up all the natural sources you're still left with a massive shortfall for the total increase. As for there being no warming over the last decade, that's not true - even accounting for Hansen's bias, the last 10 years have been some of the warmest on record with peaks in 2005 and 1998. Warming can also be effected by aerosols - the burning forests around Indonesia actually reduced the warming to an extent, and there is a delay as the oceans absorb and emit heat. GW is a horribly complex subject, I just get terribly annoyed at people who use one facet and spin it. The other Anon is a case in point, he spun the polar ice data into looking like the Arctic was cooling, conveniently ignoring the entire data and selectively using the information that supported his viewpoint. There are people like that on both sides, and it's just depressing. I suffered from a global warming tax just this morning. £12.67 for slippers.. that's after the VAT cut too. I mean, £12.67. It just isn't right. Global warming or not. I am not getting in to the debtate becuase it snowed once....for a start that will get right up these 1963 OAP's if we are reduced to that. 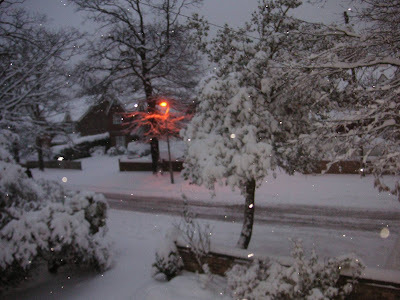 blimey fellahs, it was only a photo from me bedroom window !